Constellation Sagittarius: Archer, Dipper or Teapot? The stars of Sagittarius shine in this astrophotographer photo. Bow, arrow, milk ladle or teapot — the constellation called the Archer appears as many things besides, and you can find it down near the southern horizon this week. The many faces of the constellation Sagittarius may be an example of the psychological phenomenon pareidolia, in which the mind perceives a familiar pattern where none actually exists. After all, the "connect-the-dots" pictures of constellations we have come to recognize are all formed out of stars of varying brightness, scattered randomly across the sky. The stars of the contellation Sagittarius are visible low on the southern horizon as shown here at 8:30 pm local time for observers in mid-northern latitudes. Let's first discuss the legendary figure of a classical archer. In the sky there are constellations named for all sorts of mythical creatures, from the phoenix, a bird that obtains new life by arising from the ashes of its predecessor, to the dragon, a huge lizard, or a snake with two pairs of lizard-type legs, which can emit fire from its mouth. There is also the centaur, a creature with the upper body of a human and the lower body of a horse — in fact, it wasn't enough for ancient stargazers to place one centaur in the sky, but rather there are two. Centaurus rides above the South Pole of the heavens, while Sagittarius is in the Zodiac. Centaurus supposedly represents Chiron, the wisest and kindest of all the horse-men. Among other things, it is said that Chiron invented the constellations, pointing out the shapes to be seen in the stars and dividing them into orderly groups. In laying out the Zodiac, Chiron decided to make one figure in his own likeness, to guide the Argonauts in their quest for the Golden Fleece: Sagittarius. It is exceedingly difficult to imagine a centaur among these stars, though the brighter stars do seem to resemble the bow of an archer. In fact, three stars — Kaus Borealis, Kaus Media and Kaus Australis — mark the northern, middle and southern sections of the bow (from the Arabic "kaus" meaning bow). And then there is the star Al Nasl, another Arabic name, meaning "arrowhead." The center of our galaxy lies hidden from our view behind clouds of opaque dust, just off the end of the 'teapot' in Sagittarius. From midnorthern latitudes, look south around midnight to see the Milky Way's central bulge. This works best from dark-sky locations; city observers might have a hard time seeing anything due to the light pollution. 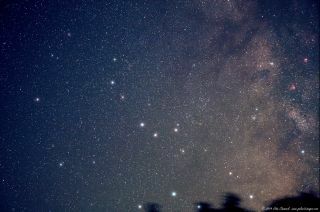 Sagittarius also marks the position of the "central bulge" of the Milky Way system, appearing as a luminous cloud of stars. The American astronomer, astronomy popularizer and early science fiction writer Garrett P. Serviss (1851-1929), once wrote, "As the glittering incrustations that cover the roofs and walls of the Mammoth Cave are often compared to the starry heavens, so, reversing the image, Sagittarius is like a stupendous cavern of space all ablaze and aglitter with millions of sparkling gems." The original Latin description of this star system's appearance in the sky is Via Lactea, literally "Milky Way." For the same reason, the Greeks used gala and kyklos, meaning milk and circle — hence the word galaxy. Although tracing out an Archer-Centaur among Sagittarius' stars does require some imagination, visualizing it as a Teapot is quite easy. In fact, it is the Teapot and not the Archer that is usually portrayed on most star charts and in observing guides. I often wonder, who was the first to visualize these stars as resembling a teapot? It does not appear in any astronomy guides or star books prior to the early 1930s. I myself find it a truly delightful pattern: As star pictures go, it's one of the best. During the 1970s, the late astronomy popularizer George Lovi (1939-1993) pointed out that we could augment our tea service with a teaspoon and lemon as well. Lovi's "teaspoon" comprises stars in northern Sagittarius, while his "lemon" is an alternate rendition of the nearby Southern Crown. As the night wears on and Sagittarius moves down toward the southwest horizon, the Teapot is seen to tip forward, seemingly pouring hot tea on the tail of Scorpius. Here, the Milky Way can serve a double function: We can visualize it as steam rising from the Teapot's spout, or if you like milk with your tea, then you can think of the Milky Way as a stream of milk that flows right on by! Editor's note: If you snap an amazing picture of any night sky sight that you'd like to share for a possible story or image gallery, send photos, comments and your name and location to Managing Editor Tariq Malik at spacephotos@space.com. Joe Rao serves as an instructor and guest lecturer at New York's Hayden Planetarium. He writes about astronomy for Natural History magazine, the Farmer's Almanac and other publications, and he is also an on-camera meteorologist for News 12 Westchester, N.Y. Follow us @Spacedotcom, Facebook and Google+. Original story on Space.com.